Moto E is already on the market. After weeks of rumors and leaks, Motorola has made the official announcement during an event held in India. 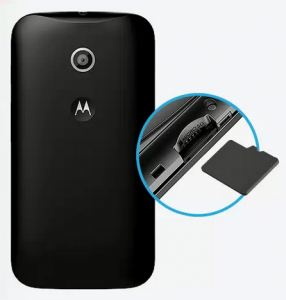 The new device follows the steps of Moto G, offering good performance with an attractive price. After launching the G Moto and Moto X, Motorola has now set their sights on the market for middle and low-end phones. In this sector the competition is fierce, but the company hopes to find its place with a very tempting product, although it needs to compete with devices from Samsung, Sony, LG and other brands well stablished on the market. The new Moto E has a 4.3-inch qHD screen with 960×540 pixels, protected from hits and scratches thanks to the coating Gorilla Glass 3. The processor is a Qualcomm Snapdragon 200 dual core 1.2 GHz and has 1 GB RAM. The internal memory is quite limited, it only includes 4 GB, but the phone has support for microSD up to 32 GB. It carries a 1980 mAh battery and will be released with Android 4.4.2 KitKat. The company also announced that it will be resistant to drops and splashes. With dimensions of 124.8 × 64.8 × 12.3mm, it weighs just 142 grams, comparable to other devices in this range. As for the camera, it includes no front camera, it only has a 5MP rear one without flash. Most competing brands offer similar terminals at a somewhat higher price (except some Chinese brands with cheaper terminals). Among the devices that are in direct competition with the Moto E, we can find the Samsung Galaxy Ace Style, the LG L40, the Nokia X, the Sony Xperia E1, the HTC Desire 500 or even the Xiaomi RedRice. However, Motorola has a reputation for excellent quality and performance of its devices, which can be decisive when choosing our next phone. 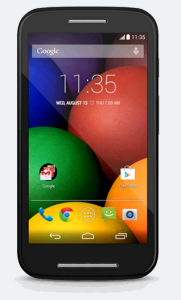 The Moto E is available on the website of Motorola and Amazon. 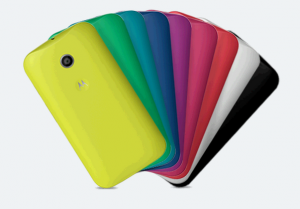 Two versions are available, Moto E Global and Moto E US version. The Global version is available now, while you can make a pre-order for the US market. The pre-order can be done at the Motorola’s website or at Amazon, and they will be shipped from June 6th. Motorola is pursuing an intensive promotional campaign for its new device, inciting people to renew their old phone for a very reasonable price. In this sense, different events are taking place in several countries to present the Moto E releases, following the one made in India. In addition, to ensure that they reach the widest audience possible, next Thursday 22th May, Steve Sinclair (Product Marketing) and Bill Park (Product Manager), will answer all sorts of questions about the software and hardware of the new Moto E. The event will take place through Hangouts, and everyone is invited to send their questions via Google+, Facebook or Twitter, using the hashtag #AskMoto .